The 200th anniversary of "The Star Spangled Banner"took place in September, 2014. 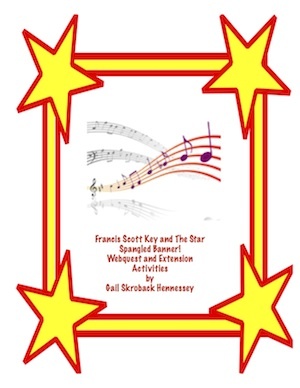 Learn about Francis Scott Key, the War of 1812 and the flag that sparked the national anthem with this fun/informative web quest. Years later, Key wrote this about his famous poem that became our nation's song. "Through the clouds of war, the stars of that banner still shone...Then, in that hour of deliverance and joyful triumph, my heart spoke, and 'Does not such a country, and such defenders of their country, deserve a song? With it came an inspiration not to be resisted." There are NINE Webquestions in the complete resource. 1. How did fighting the French hurt the British attempts at fighting the United States? 2. Why do you think the British set fire to the White House, the Capitol Building and the Library of Congress? How might the British actions work against them? 3. Why do you think the American soldiers sang the song Yankee Doodle after the attack on Fort McHenry? There are NINE comprehension/thought questions. Have students work in small groups to do the web quest and comprehension questions.Afterwards, have students regroup and discuss the activity. Francis Scott Key wrote the words to his poem in pencil! There was a huge rainstorm the night before the battle. The flag, made of500 pounds of cotton was taken down and a substitutestorm flag raised. After the battle, the larger flag went back up. There are SEVEN Fun Facts in the complete resource. 1. Pretend you are the American flag: Tell about a day in your life. Where are you flying? What do you see? Hear? Feel. 2. In 1807, President Thomas Jefferson tried to harm the British economy byplacing an embargo against the country of England. That meant goods could not come from England to the United States. Why do you think the President ended the embargo in 1809? There are FIVE extension activities in the complete resource.